Panta Rei Fusion Dancing & Handdrumming celebrates the idea that everything flows and is constantly changing. Panta Rei Fusion Dancing & Handdrumming takes elements of Spanish, Gypsy, African, Asian and Middle Eastern styles, and combines them with more modern styles, to create a fusion of spectacular choreographies, costumes and rhythms. All dances are different, with emphasis ranging from the smooth moves and wave patterns of veil dancing, to the more rhythmic shaking and shimmying of drum-dances. Some dances focus on exciting African percussion or Latin rhythms; other dances embrace the more reflexive ambiance of relaxation music. 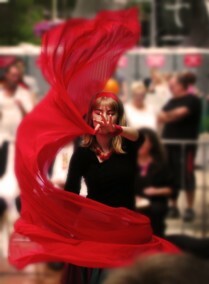 All choreographies are designed to match movement with sound and colour in a celebration of harmonious flux and renewal. 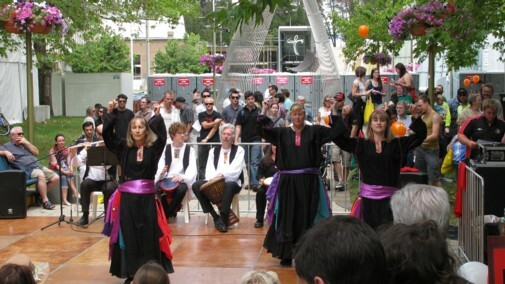 Panta Rei Fusiondancing & Handdrumming also gives public performances at local festivals and for community groups. Some members love to perform, others just come to classes - nobody is pressured into performing. Panta Rei Fusiondancing & Handdrumming creates a friendly, stimulating and supportive environment that builds up each person's self-confidence, where nobody is judged or put under pressure, and where everyone feels inspired and encouraged to take part in and enjoy a world of dance, costumes and music. Wonderful day, great audience, thanks all! Παντα Ρει (pronounced as: Panta Rei) is a phrase that sums up the philosophy of Heraclitus, who lived around 500 BC in ancient Greece. Panta Rei translates as "everything flows", indicating that everything is constantly changing. Applied to dancing, it means that there are no fixed steps, but that movements smoothly flow into each other, as the dancer is inspired by the music. Panta Rei, the dancer, set out to design choreographies along this philosophy, as well as costumes that emphasise flow, such as veils and wide skirts with lots of flamboyant colours. Panta Rei has been a teacher for most of her working life, teaching many different subjects at many different schools, but her real passion has always been with dance. She studied classical, modern and ethnic dance with various dance specialists in Europe, the US, New Zealand and Australia. Eventually, she combined the various styles into a whole new type of dance, fusing elements of African, Spanish-Gypsy, Asian and Middle Eastern styles and merging them with more modern dance. Over the years, Panta Rei has developed her own style of world dancing and music, after having designed numerous choreographies and costumes to suit the flow of the movements and the dynamics of the various themes thus arranged. At suitable times, guest instrumentalists are encouraged to improvise live on these themes, and the audience is invited to join in as well. 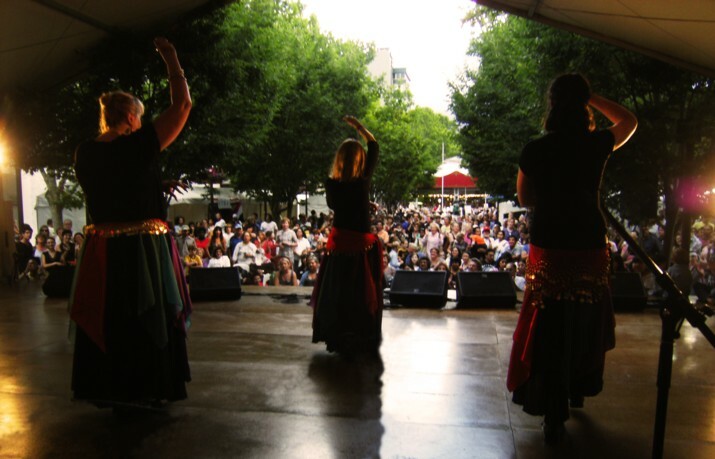 Panta Rei Fusiondancing & Handdrumming gives classes, workshops, demos, haflas and performances, and is a popular act at Canberra festivals for their spectacular display of dance, their driving rhythms and their stunning costumes. Classes in Goulburn start Tuesday 3 May, 6 - 7:30 pm at Goulburn Public School Hall, 204 Bourke Street. Classes in Canberra are at QL2 Studio, Gorman House, and Civic Library Hall. Panta Rei Fusiondancing classes: an easy-going follow-the-leader-style of dance class without stress to remember steps, while having fun and a gentle work-out at the same time. Dance classes are a great way to get fit and stay in shape in a friendly and supportive environment, to dance without pressure and to make new contacts. Nobody is judged and there are no mistakes, only "little variations" that help towards each dancer's self-development. No dance experience is needed. You can wear loose-fitting, comfortable clothing; perhaps you can tie a scarf around your hips, but definitely bring a smile along. 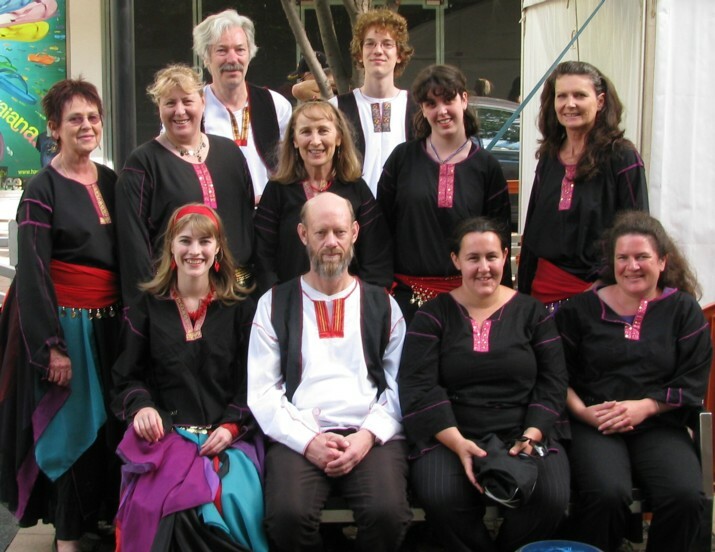 Panta Rei Hand-drumming classes: learn different Middle Eastern and African rhythms, learn to drum in sync with a group and work towards accompanying the dance group. Bring your own handdrum or contact Panta Rei. © Panta Rei, 1998 - 2011, all rights reserved.